It’s important to look into the traits of the best senior living communities before choosing a home for your loved one. With about 1 million Americans currently living in senior living communities, it’s clearly a hot commodity. Plus, that number is expected to double within the next 15 years. As health care has progressed over the years, today’s seniors are living longer, more active, and healthier lives. Over the next 20 years it’s predicted that the 85+ population will triple from 5.7 million (recorded in 2011) to 14.1 million. That means that this large and active population will need a place to stay where they can continue their fruitful lifestyle in a safe and supportive environment. That’s why it’s so important to know how to find the best senior living communities and make the right choice. Every senior living home is uniquely designed to fit the needs of its senior residents. However, there are a few top traits to be on the lookout for when hunting for the best senior living home. Below are all the top traits for the best senior living communities. The main goal when moving a loved one into a senior living home is to get them the care they need. Whether it’s independent, assisted, or memory care services, you want intuitive staff that are dedicated and compassionate no matter what assistance level is needed. You can determine if there will be individualized care if there’s a good resident-to-staff ratio. Meaning there are enough qualified staff members to give each resident that care and attention they need. Many senior homes offer room cleaning and laundry services to ensure their residents are living in a safe and clean environment. There should also be a janitorial team to sanitize the rest of the living community, keeping things tidy and germ-free. It’s so important to find a clean home to protect your loved one from illness and diseases. It’s important that your loved one feels right at home in their new home. Moving from their previous home can be stressful and sometimes even traumatic. The best communities lessen the fear and trauma by providing a warm and welcoming atmosphere to make residents feel more at ease. This can be provided through cozy common areas, libraries, game rooms, dining rooms, etc. The best senior living homes promote socialization and the benefits that come along with a healthy and social lifestyle. That’s why guests should be welcome to visit the community anytime they please. Friends and family play a vital role in the emotional well-being of every resident so it’s important that there are no restraints against visits. When you find the right residence for your loved one, you will know by the atmosphere and the amenities they offer. A senior living home that offers social activities, exercise classes, outdoor barbecues, arts and crafts, transportation options, and other encouraging amenities will help your loved enhance and enrich their quality of life. 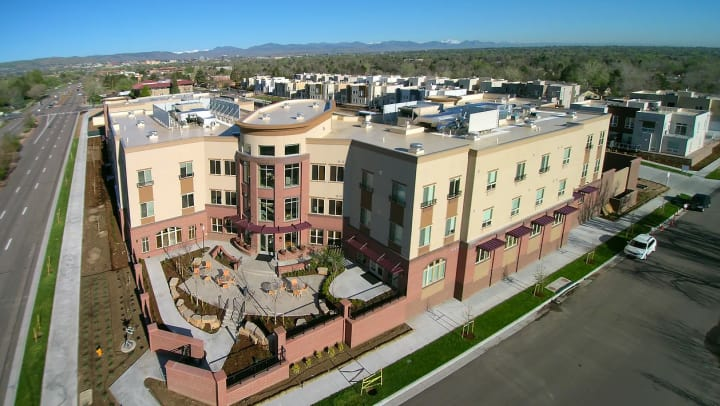 Village at Belmar is an inspiring senior village located in Lakewood, Colorado. We offer the perfect intimate location with enriching amenities and services geared to make every resident feel right at home. Our living community is geared towards creating a happy and healthy lifestyle for every resident, while providing a dedicated team of compassionate staff members, here to assist each and every senior with their needs.